Although we are currently based on a campsite and have been reflecting on the benefits of campsite life, we've also been taking time to think about the differences between aires and campsite we've experienced on our trip. For some people, like our concerned family members, the words 'motorhome aire' are synonymous with burglaries and 'gas attacks' which they have read about in the papers and online forums. For others, motorhome aires are just a free or cheap way to stay the night. As far as they're concerned they've already paid for their motorhome, why should they keep paying to park it somewhere as well. Personally we fall somewhere in between and have always budgeted to spend some nights on campsites every month, however, we also know there is no way we could afford to pay for campsites every night either. Perhaps it is because free or wild camping is so generally frowned on in the UK, but initially we felt quite nervous at the prospect of staying on free aires in strange places. However, we've come to learn that motorhome aires are really nothing to be afraid of after all and with a bit of common sense we've always felt quite safe on them. What is a Motorhome Aire / Stellplatz? First things first we should probably be clear about what we mean by motorhome aires or stellplazten. Unlike what our concerned family members thought before we set off, we don't mean Aire de Repos (rest stops or picnic areas) that can found alongside motorways or other major roads throughout Europe. There's generally a picnic bench or two for families during the day, but as night falls we've seen that there will usually be several trucks in them. Almost invariably everyone we've spoken to about aires immediately warns us not to stay on the "motorway aires" unless we want to be gassed, robbed or murdered in our beds. This is certainly what our families seemed to think we meant as well when discussing our plans before leaving and this general consensus seems to be repeated on motorhome forums too. Following this advice we've never tried or considered trying these motorway rest stops anywhere we've traveled. That said, we do often see motorhomes parked seemingly for the night as we've driven past and wonder whether these people have received the same advice we've heard so often. Other types of overnight parking which I'm not including here in our definition of aires is "free" or "wild" camping in large car parks, laybys, by beaches or just on a quiet side street somewhere. Although we did stay for free on a few quiet suburban streets in the UK, arriving late and leaving early, we just don't feel comfortable doing so in cities or suburban areas outside of the UK. Although we've met a lot of people who do exactly this, we feel that with UK number plates we are obviously tourists and feel at risk of being moved on by officials even if there is less danger of criminal activity. We have, on a handful of occasions, stayed in supermarket car parks where we've seen a large group of motorhomes already doing so and told it was authorised. We have been recently advised it is worth asking in the store (or with security guards if they are present) if it's ok to stay one night and may do so more often in future. For us motorhome 'aires' means designated motorhome parking areas (Aire de Camping Cars in France; Stellplatz in Germany and Austria) provided and maintained by villages, towns or cities usually with some type of motorhome services station offering options such as grey water and cassette toilet emptying and refilling of drinking water. Overnighting on an aire is usually allowed for a maximum of 24 or 48 hours, although in some cases we've been allowed to stay up to 2 weeks. The parking itself might be free or might attract a fee and any or all of the services may be charged as well (if there is an electric hookup that is almost always extra). Generally speaking the more the parking charge is the more will be included. Some aires even provide toilets and showers and feel more like basic campsites than aires (from our experience in the off-season some campsites officially close but maintain a basic aire service next to their regular pitches or in the car park outside their camping). The most we have paid for an 'aire' is 11 euros, although at this price the line between campsite and aire was a little blurred with toilets and showers, no electric hookup but on-site security and barriers in place. In reality most of the aires we have stayed at are essentially car parks, either just for motorhomes or at the side of larger parking areas where a few larger bays have been especially painted. Usually there will be a motorhome sign nearby as well stating the rules such as "24 hours max" or "7pm - 9am only". The most secure aires we have experienced (such as in Ax-Les-Thermes in France) have included an automatic parking barrier and upon payment you'll get a pin code to allow entry and exit during your stay. However, at the other end of the scale we've also stayed numerous times at bare patches of concrete with no services or parking bays marked out, but just a small sign indicating motorhomes welcome or having been told it was ok to park there overnight by tourist info. Some aires are busy and cramped, others have been quiet and secluded and this can make a huge difference to our decision to stay or not (see below). Finding motorhome aires is actually quite easy and has become a big business in Europe with several different publishers offering guides and maps for different regions (you can even purchase motorhome specific satnavs with the GPS coordinates of aires pre-loaded). We personally have found Camperstop Europe and All the Aires France has been sufficient for our needs so far. We have also found ones not listed in these books on recommendation and from tourist information we've picked up on route such Mitchelin's 100 Most Beautiful Detours. We've also been told by a number of other motorhomers that the French "Passion" scheme has worked very well for them. For a small fee the 'Passion' the book details numerous farms in France which allow motorhomes to stay one night for free in return for a small purchase in their farm shop. Every European country is different in terms of motorhome facilities. From our research prior to setting off the consensus seems to be that France in particular is leading the way in terms of motorhome friendliness and facilities for those on longer tours. For this reason we planned to start our own adventure in France and this has definitely matched our own experience as well. 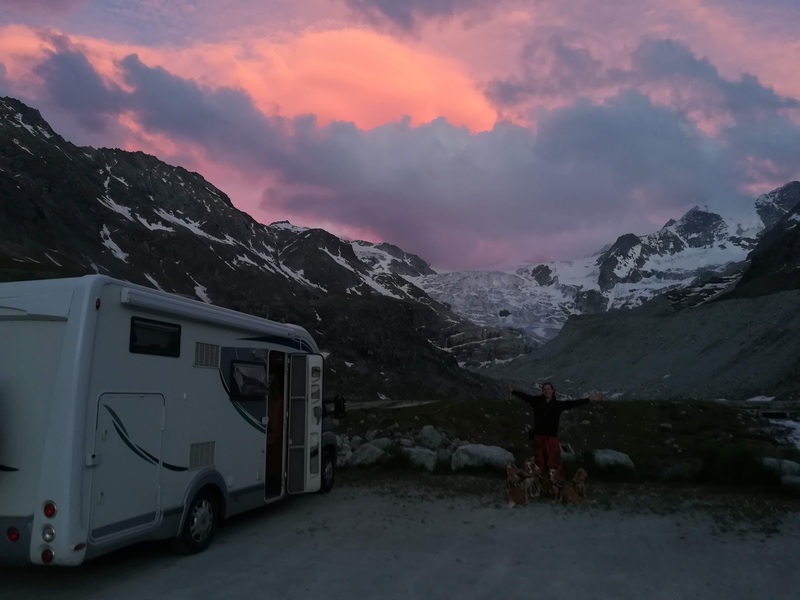 From our experience, in Holland and Switzerland motorhomes aires seemed pretty rare (there are some to be found) but wild camping was strongly discouraged and policed. During our brief time in Italy we found the aires varied massively in quality and we didn't feel happy staying at any of them (see below). Since coming to Spain we have often been advised to be especially cautious on aires in general due to relatively high crime rates and have so far stayed on only one aire and the other nights on campsites or paid aires with some form of watchmen/barriers. Other European countries we haven't visited yet, like Germany with an extensive number of Stellplatzen, also get good online reviews and Portugal is mentioned in our Camperstop Europe guide as trying to encourage tourism by increasing its facilities for motorhomes in the last few years. We've read that in Scandinavia and Norway in particular, wild camping is more widely excepted which might give a cheap option for touring. Obviously in Britain, this is frowned upon and although we have heard some people we've met talk of some aires, they aren't widely publised and are few and far between. How we judge whether to stay at an aire? Just as European countries vary in their provision of motorhome services, we have also found that every single motorhome aire is different in terms of location, services and atmosphere. Some aires are in built up urban areas, others in secluded rural locations. Sometimes they are busy (or full) and other times we might be the only motorhome there. We have found that we get a feeling for an aire usually within a few seconds of arriving that determines whether we are going to stay the night or not. The factor that tend to affect us the most is the number of other motorhomes as we get a distinct feeling of safety in numbers. Even if an area looks a little run down and the services are a little run down, finding an aire with a large number of other motorhomes already settled for the night is a reassuring sight. On the contrary pulling up to find an empty aire, or just one or two old, tired looking motorhomes that look like they may have been dumped there is very off putting and we're more likely to move on to a backup location. That said, however, we learnt very early on (particular when we spent 7 nights on the aire at St Laurent near Nice) that when planing to stay at an aire for more than one night then all of the other campers might be moving on and you'll end up alone getting a very different feeling. We've driven past aires as they were empty only to pass the same aire a few nights later to see them full up, and vice versa. After the number of other people staying the night, the state of the surrounding area is the next most important factor to us. If the aire is generally clean, tidy, there are signs it is being maintained and the surrounding area is a quiet residential space we're much more likely to stay than if we pull up to find a graffiti decorated, disused warehouse car park with several dumped cars. (One aire in Italy at the time we arrived had a police car in arresting some joyriders). Although we might overlook some level of dilapidation of the aire if busy, if it's quiet we'll almost certainly move on. This feeling can be massively affected by whether it's dark or not so we always try and arrive before sunset to get a proper impression of a place. We love being in the mountains and many of the aires we've stayed at have been especially remote. We feel that even if an aire looks a bit run down and we're the only ones there, if it's 1700m altitude at the end of a remote valley then any criminals are going to have to come a long way to cause us trouble so may overlook the isolation a little (also if we want to hike there we probably don't have a backup as usual). If in need of reassurance we'll usually ask at the tourist information upon arrival. Although similar to point 3 above, we have felt very different in Spain and Italy purely and simply based primarily on other motorhomers advice as well as general crime statistics, unemployment rates and knowing that there is less policing of the aires as we might have expected in France and Switzerland for example. We think it is quite telling that all the campsites and paid aires/camper parks we've stayed at in Spain so far have big gates, some lock you in at night and there are guards. The same aire, with the same number of campers in a similar location would maybe feel very different to us in France vs. Spain. If everything looks good and we think we're going to stay, one of the first things we try and do before settling in for good is to introduce ourselves to another motorhome (we can get by in English, Dutch or French at the moment) to see if they have stayed before and ask their opinion or experience of the area. Most motorhome aires are reserved for motorhomes only and the presence of caravans, we have been warned, can indicate that a traveler community has set up long term residence. We've arrived at some aires to find a fairly obvious long term settlement of several families and have moved on to our backup. We've been warned that spaces occupied by such communities tend to have higher crime rates. Just as in the UK certain areas seem to be a magnet for groups of youths who, even if they're not causing trouble, might be noisy and cause a general nuisance and stop you having a peaceful night. We spent a night in a sport centre car park that looked a bit run down and at 1am a car showed up with speakers blaring and stayed until 5am. They didn't cause trouble, but we felt on edge. Wherever we travel and whatever aires we discover, we always try and remember one key piece of advice were given very early on in our travels. No matter what an area feels like and how many other motorhomes are there, never forget that you are always a little vulnerable and you have to make your own judgement. Whatever we decide we try our best to always remain vigilant and alert to potential risks. To us, common sense is the best protection we have but we don't let preconceptions and media horror stories put us off. In addition to other motorhomers on longer tours like ourselves, in particular over summer we have seen many individuals, small and large groups, families, old and young all making use of motorhome aires. We've spent more than three quarters of our nights so far on aires and in our opinion motorhome aires are a fantastic service and offer a cost effective way to travel Europe in a motorhome. Click here to see our routecard with all our overnight spots on.